Photos from our second competition, August 18 & 19th, 2005. We didn't get as many photos due to the trip there and the heat! Check out any blog entries here. This was our site... It was supposed to be 20X20, but was more like 20X40, which was great. 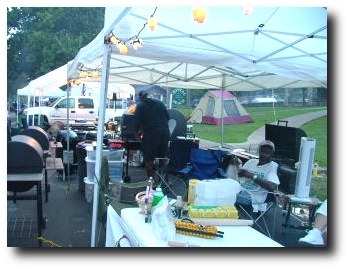 We had lots of room, for lots of cookers. 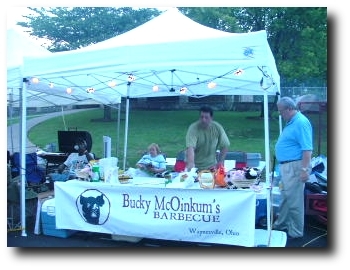 We added 2 Chargrillers to the 2 we had in our first competition, and a WSM. Tony Hunter supplied the WSM and an extra Chargriller. Please not the cow and pig lights on the new EZ Up. Much better organization for this one than the first! 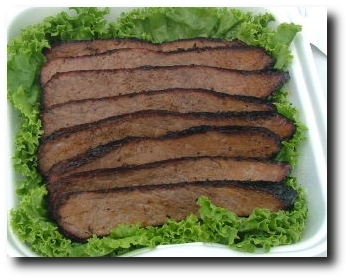 This looks like just any old lump o' meat, but it's actually a Wagyu brisket (Kobe beef is Wagyu). We just tried one to see how it would work out. Comp attendees loved it, but it was too done at 190 degrees; we thought it tasted like potroast! I've done one since to 182 that turned out GREAT! Trust me on this one.. It was TENDER! 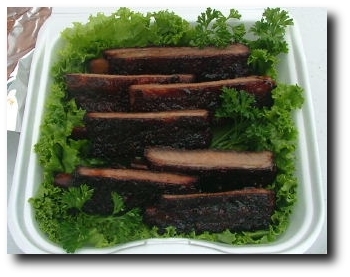 This is our box of St. Louis ribs. Great taste, too done. :( We still had a lot to learn, on presentation! 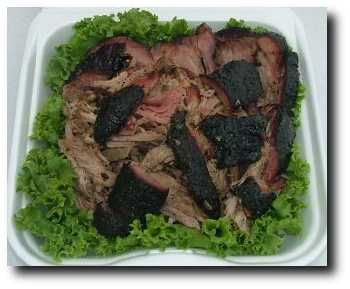 It's not easy to tell , but we had both sliced and pulled pork in the box. We did ok with this entry, especially after learning how to make it look less dry. This was our brisket turn in. I was much happier this time than our first comp, as it didn't dry out. 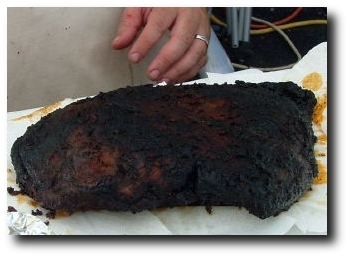 The thing I didn't like was that we didn't get any smoke ring; we did the brisket on a WSM, and somehow just didn't get that nice pink smoke ring. This is our chicken turn in box... I didn't have my camera out, but my sister snapped a shot with her phone. It's not a great picture, but we got all 9's in appearance. 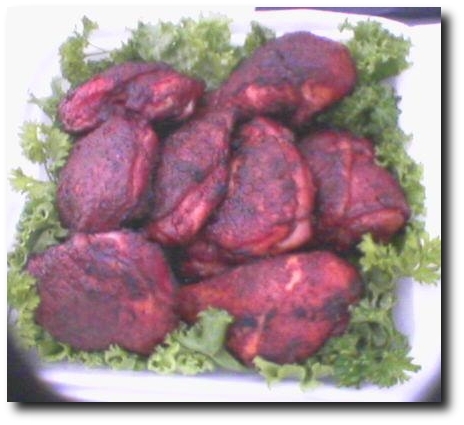 This is also the chicken my mom said was the best she'd ever had, but the judges disagreed!